Dallas County reported 398 cases of human West Nile virus in 2012. 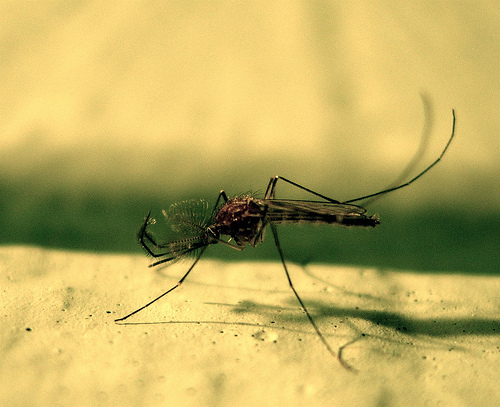 Nineteen people died of the mosquito-transmitted illness. Plans for the 2013 West Nile season are taking shape. Dallas City Council members and County Commissioners get updated this week. West Nile season is May through November. The city of Dallas 2013 West Nile Response Plan provides more traps to catch mosquitoes and test for West Nile, and plans to equip one more truck with a pesticide spray unit. Dallas County health officials want to be ready to go with truck spraying by May 1st. Both plans endorse aerial spraying if necessary. East Dallas beekeeper Brandon Pollard is disappointed to see a continued focus on spraying. He has argued for killing the larvae before the mosquitoes hatch, fly and bite. He says the mosquito pesticide is toxic to bees and last season’s spraying took a toll on them. Pollard says that’s his educated estimate of his 2012 bee census. County Judge Clay Jenkins, along with representatives from the Centers for Disease Control assessed last summer’s aerial spraying. Jenkins says there were no major adverse effects reported to the county, and the kill rate for mosquitoes was very successful. New this year, the city of Dallas is buying 46,000 dunks, small, biological do-nuts that kill mosquito larvae when dropped into standing water. They’ll be handed out at community events starting April 1st. And this year city code inspectors will carry dunks to use them as they encounter possible mosquito breeding grounds. Next month, the city and county plan to present their emergency plan should a West Nile outbreak be declared again this year.